I saw that sparkle in her beautiful brown eyes as I pulled the pink cotton dress up by the hem to lift over her arms. “I was with Jesus ‘fore I was in your tummy.” Her child speak was muffled by the clothing. “I was with Jesus ‘fore I was in your tummy,” the words more deliberate this time. She was my second daughter, a child I worried over during pregnancy. Worried she’d be unloved, that I couldn’t care for another the way I did my first beautiful baby girl. Of course, I later marveled holding her in my arms, realizing God had made my heart grow rather then depriving this little one of what she deserved. I pulled the dress the rest of the way off, setting her arms free. “I ‘member.” She nodded at me as if to make it understood she was being serious. “You remember what Honey?” I slid a tee shirt over her head. I pulled the overalls up and fastened a button on each hip, turning her from one side to the other, her short brown hair bounced as she swayed. Just as one shoulder strap was in place, the sound of potatoes boiling over drew me over to the stove. She followed. “K.” The double doors on the lower half of the pantry slammed shut behind me. I stirred the potatoes and lowered the flame. The table would have to be set soon, but I had to know what this child was getting at. She was something, always inquisitive and ready to explore the world, but also so stubborn and determined to get her way that she’d act up, strike out at her older sister, defy orders. It wasn’t that she was a bad kid, just so busy living and learning, she didn’t have time for anything that stood in the way. “Not a baby, Mama.” She pursed her lips, giving me a look I’ve seen many times over the years since, especially those teenage years. “Okay, not when you were a baby.” I tucked an errant strand of brown hair behind her ear. Goose bumps ran down my arms. They come back to this day when I think about her words that Sunday afternoon. I walked her to the table and sat down. She stood in front of me. Holding each of her hands in mine, I looked her in the eye. “Yep, I was in there.” Curls bounced as she nodded, her chin nearly hitting her chest with the enthusiasm. I plastered a smile on my face, not sure she’d go on, not sure I wanted her to. She yanked one hand away from mine and pointed to the hallway. I couldn’t speak. Still gripping one of my hands, she led me down the hall. Photos of the two girls lined one wall. At the end, photos of my family were clustered together. A picture of my older brother in his tan leisure suit at graduation, my younger brother in his Marine Corps uniform, and shots of each of my sisters at graduation. “That man told me to pick you out.” She pointed to a photo of my dad. He’d died nearly four years before her birth. I hated that picture of him. I had hung it low on the wall so it seldom caught my eye as I passed. His eyes looked big, magnified by huge 1980’s glasses. My daughter watched me with curiosity, uncertainty. The lump in my throat felt like a Ping Pong ball. Tears started to gather in the corner of my eyes. I dabbed them away. “He said you should be my mommy.” She said it softly. I knew she was telling the truth. Her bottom lip trembled. Tears welled up in those big beautiful brown eyes. I hadn’t realized it, but it hit me right then, those weren’t her father’s brown eyes, she had my father’s big brown eyes. “When I was in heavnen, he told me to pick you out, pick you for my mommy,” she whispered. My own tears couldn’t be stopped. I knelt down, hugged her and breathed in the sweet innocent smell of baby shampoo. She doesn’t remember ever telling me she’d picked me out. And didn’t just a few years after that, but I can never doubt the truth. I know the blessing she’s been in my life. I know the blessing of each of my girls. 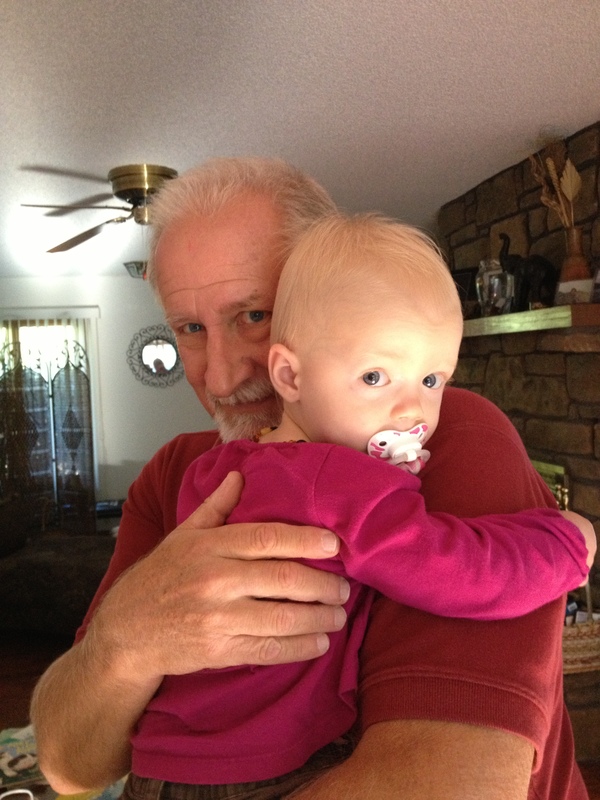 Reagan, my granddaughter, has a similar wise and knowing look in her beautiful blue eyes. She came to stay with Lloyd and I this weekend. I took a photo of the two of them and wonder as I look at that picture, both their eyes looking directly at me, what we really know in those early years that is forgotten as we make our way through this life on earth. This entry was posted in Uncategorized and tagged baby eyes, God, goose bumps, Invitro choice, Jesus, Life before living by Lori Ericson. Bookmark the permalink. Very moving! Made me cry! Great story with wonderfully profound description. Thank you Sara. It’s a story that’s very close to my heart!